Home > Peter Harrington > Intentions. London: James A. Osgood, McIlvaine & Co.,, 1891. The Decay of Lying; Pen Pencil and Poison; The Critic as Artist; The Truth of Masks. Octavo. 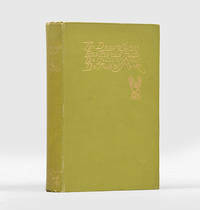 Original green cloth, spine and front cover lettered in gilt. Bookplate to pastedown. A little rolled, spine slightly darkened and bumped at ends, else a very good copy. First edition, first impression, of Wilde's collected essays on aesthetics, originally published in journals from 1885 to 1890, and here revised by Wilde. Of this edition 1,500 copies were printed, of which 600 were issued in America.